'Ek Se Bhale Do' is a heartwarming story of a very tender relationship between two innocent souls - one based on the most basic emotion of love and affection for one's sibling, standing by each other through thick and thin and completing each other . The show is produced by Swastik Productions. The show dwells on the sweet relationship of the parents with their six-year old daughter. And also it showcases the relationship between the cute girl and her elephant. The story revolves around the forest with an elephant playing an important part in the serial. Ananya Agarwal: Ananya Agarwal, who was earlier seen in Kyaa Hua Tera Vaada and Amrit Manthan, plays the central character as Darpan. Aditya Redij: Handsome actor Aditya Redij, who gained fame from Junoon - Aisi Nafrat Toh Kaisa Ishq and Encounter is seen in the show as Mahesh, Darpan's father. Shweta Munshi: The stunning actress Shweta Munshi of Maayke Se Bandhi... Dor fame has roped into the show as Prabha. 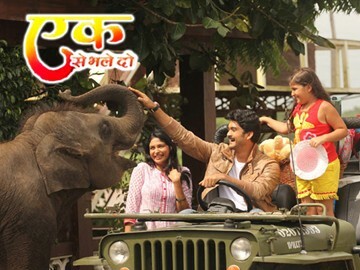 Ganesh as Ganesh: Darpan's younger brother is a baby elephant. Nearly 6 feet tall, Ganesh is a cute, cuddly, naughty and extremely stubborn baby much like real human babies are at his age. Rajesh Puri: plays the role of the Lala in the village- a big time miser. He have a oanga with the little girl and her elephant, as per the story line.